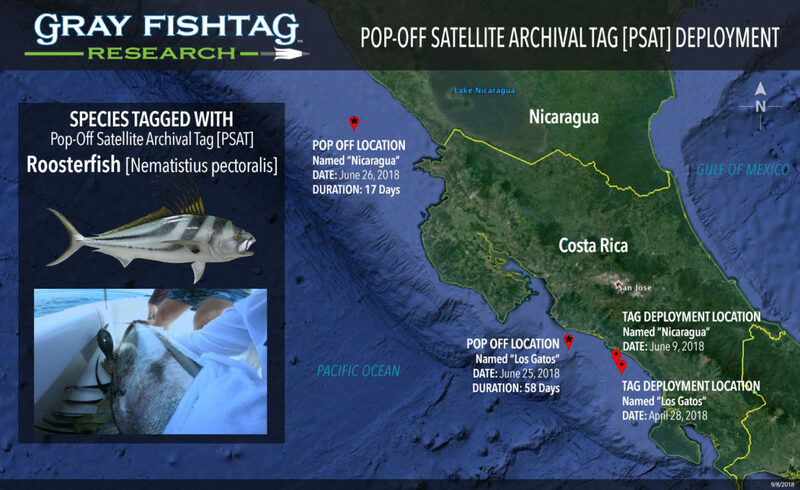 We are thrilled to announce that two of the Pop-Off Satellite Archival Tags [PSAT] we deployed during the “Los Gatos” expeditions earlier this year in Costa Rica have Popped-Off. We are currently in the process of gathering and analyzing the data. We will have an initial movement pattern of both Roosterfish soon, and we will of course share this information with you as soon as it is available. These PSAT’s are part of a larger project evaluating Roosterfish behavior and movement along the Central American Pacific coast. They were deployed during our visit to the great marina and fishing location Marina Pez Vela and the entire event was sponsored by the Ortiz family and several employees at Marina Pez Vela. The second PSAT named “Nicaragua” was deployed on June 9th, 2018 and popped-off 17 days later on June 26 off of the southern coast of Nicaragua. The distance of around 228 miles (Straight-line distance) this fish moved during the span of 17 days is also amazing and noteworthy. It’s exactly this sort of data that we are looking for, which will allow us to learn more about this species. These are the kind of stories that make our program so unique and worthwhile. The large Gray FishTag Research network, all the supporters, Charter Captains and Mates, marina personnel and friends in general, all pulling together making the program move ahead. We could not do this without all the help and we are forever grateful. Stay tuned for the most detailed analysis ever, of a Pacific Roosterfish. By getting the actual tag back, we are now able to get a complete and total picture of all its activity.